Product #60780 | SKU 996014001 | 0.0 (no ratings yet) Thanks for your rating! 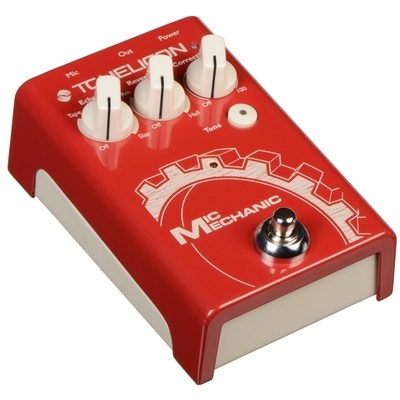 Now updated to accept AA batteries, the Mic Mechanic 2 from TC-Helicon is a complete vocal toolbox housed in compact, stompbox enclosure. The combinations of the reverbs and delays taken from the company's VoiceLive series are designed to enhance and complement the natural timbre of the voice. Lush reverbs can surround a voice with a great sense of space, be it small or large. From short slap back echoes to long repeating phrases, delays add that special "something" to vocals. The Tap Tempo feature sets the delay times to match the music perfectly. The pedal can also automatically adjust AEQ, compression, de-essing, and gating for a consistent vocal sound. Auto chromatic pitch correction gently guides the performer towards the "true" note — just a bit flat or sharp, and the correction steps in and provides a little or a large nudge in the right direction. Correction can be transparent or used as an effect. When it's time to talk to the audience, the reverb and delay can be switched off while the other vocal processors remain in place. This action can also be performed using specific microphones that comply with the Mic Control protocol. For the purposes of increased portability, this iteration of the Mic Mechanic accepts four AA batteries.